Please note that even after installing the necessary software and registering expanded content, the extra jobs, new areas, and other features contained within the Treasures of Aht Urhgan version update will not be available until April 19. A new type of defensive battle called "Besieged" has been introduced to the Empire of Aht Urhgan. A new type of battle called "Assault" has been added to the Empire of Aht Urhgan. 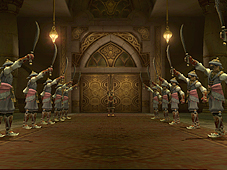 Adventurers who are level 50 or higher and have become a mercenary can participate in Assault, starting from an early stage in the Aht Urhgan storyline. You will earn Assault points for each area where you clear an Assault mission. Like Conquest points, you can trade your Assault points for various items. In addition, repeat success in Assault will make you eligible for a mercenary rank evaluation. Clear the rank evaluation and your mercenary rank will rise, resulting in a greater variety of available Assault missions and other benefits. You can find out more information by speaking to an NPC at the Commissions Agency in Aht Urhgan. 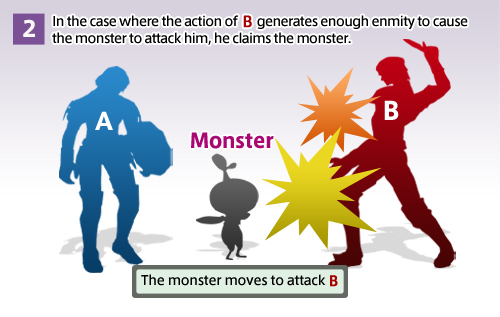 Unlike Dynamis and Limbus, multiple parties can enter separate instances of an Assault area at the same time. However, if there are too many parties using an area for Assault, you may be unable to enter for a time. You will receive a “homing fireflies” temporary item when entering an Assault area. The homing fireflies cannot be discarded during the mission. A new ship route has been added from Mhaura to Al Zahbi. You must fulfill certain requirements before you can board the ship to Al Zahbi. The new storage feature "Mog Locker" has been added. You will be able to lease a Mog Locker after completing one of the first Aht Urhgan missions. Initially, you will be able to store up to 30 items in your Mog Locker, but it can be expanded to hold a maximum of 50. You can use your Mog Locker in an Al Zahbi Rent-a-Room. A fee in Aht Urhgan currency is required to lease a Mog Locker. Once your lease has expired, you will be unable to access your Mog Locker until choosing to extend the lease. Your items will still remain in the locker until you extend your lease, and will not disappear. You can confirm the status of your lease by speaking to the moogle in your Rent-a-Room. You can extend your lease or confirm its status by speaking to the NPC "Fubruhn" in Al Zahbi. A new feature called the "Kokba Hostel" has been added. You can reserve the facility for a certain amount of time to use for private functions. Players are provided with a variety of temporary party items and food upon entering the hostel. Attendants and a special hostel chat channel also come with the reservation. Reservations can be made for one-hour slots (Earth time). During the hostel reception period, you will be asked to set a password. Only players who enter this password will be able to enter the hostel during your reservation time. Each person who enters the hostel will be required to pay a fee. NPC "Attendants" provide additional services in the hostel, such as offering goods for sale and removing meal effects. You can select four attendants during the hostel reception period. You can receive temporary party items even if you do not have any free space in your inventory. The temporary party items and their effects will disappear when you leave the hostel or when your reservation period ends. You can now lease a Rent-a-Room in the new towns of Al Zahbi and Aht Urhgan Whitegate. In the event that you change jobs and leave the Rent-a-Room in the new areas, please note that there will be no option asking you to set your home point. Previously, you could use a Pursuivant's teleportation service to travel to a match site from the beginning of the entry period to the beginning of the match. The availability of this service has been extended to last from the beginning of the entry period until the end of the match. You can now speak to a Herald to receive teleportation service to or from a match site for 100 Ballista points, even if you do not possess a Ballista Instawarp or Instaport. You can now speak to a Pursuivant in Bastok, San d'Oria, or Windurst to participate in an official match. Additional ways to earn points have been added. The Flammen-Brenner can now recover from damage. The behavior pattern of Posten has been altered. The prerequisites for achieving Complete status in an official match can no longer be changed. After altering certain rules in an official match, the changes will be announced to everyone in the area. In the event of a called game 10 minutes or less into an official match, the losing team will now earn a reduced amount of experience points. Some of the temporary items earned by "quarry" have been changed. The advanced jobs "blue mage," "corsair," and "puppetmaster" are now available. You must clear certain quests in order to acquire the new jobs. The final limit break quests for the new jobs are scheduled to be added in the next version update. For the time being, you must clear the "Shattering Stars" quest with another job in order to reach level 71-75. Several new monsters have been added to the Treasures of Aht Urhgan areas, some of which attack in response to certain actions, such as the use of job abilities or weapon skills. 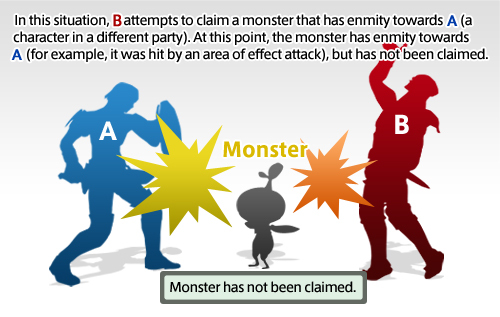 The conditions for claiming monsters has been changed in the following ways. 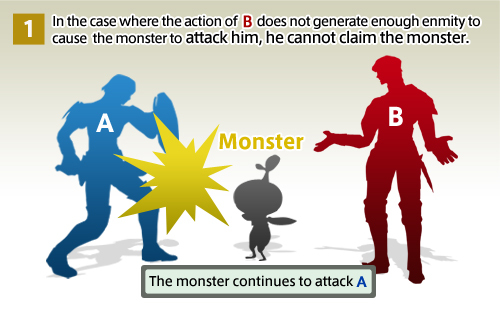 Accordingly, players will no longer be attacked by monsters that they themselves are unable to attack. Monsters' area attacks have been altered to affect the players who have incurred the notorious monster's enmity and their party or alliance members, rather than all players in the area of effect. Certain monsters will be exempt from this change. In accordance with the addition of blue magic, several monster techniques have been altered. Appraiser NPCs and a new type of mysterious item have been added. There are several varieties of mysterious items, such as "??? swords," "??? gloves," and "??? rings." These items cannot be used or equipped until they have been appraised. Appraisers may be found in towns such as Al Zahbi. Trade a mysterious item to an appraiser to learn its true name and features. After your find has been appraised, you will be able to equip or use it as a regular item. When you are in a party, the appraised item will be placed into your treasure pool. When you are solo, the item will be placed directly into your inventory. Please note that you may be unable to receive an appraised item if it is Rare and you already possess one in your inventory. Equipment sets are now available. The wearer can receive a special effect only if the pieces of the set are equipped together. The status effects of each individual piece of armor will still function when worn separately. The temporary item “Qiqirn mine” has been added for use in Assault missions. You must be engaged in battle mode against the target you wish to use the Qiqirn mine on. If you are not engaged in battle at the time the mine would normally explode, it will be ineffective. 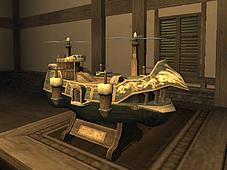 The item "miniature airship" has been added as a special item available 365 days after participating in the "Adventurer Recruitment Program"
The option "View Safe" on the main menu has been changed to "View House." Now you can check the contents of your Mog Safe, Storage, and Mog Locker using this feature. The category "Dice" is now available under "Scrolls" at the auction house. The search function can now be used to locate blue mages, corsairs, and puppetmasters. There are new places to fish in the Treasures of Aht Urhgan areas. The effect of fatigue that occasionally occurs after fishing with the Ebisu fishing rod has been slightly reduced. Players who cancel fishing after hooking a fish will now accumulate fatigue. An issue regarding devil mantas on Cape Teriggan has been fixed. The "PlayOnline" option on the main menu has changed to "Shutdown," which has the same effect as the /shutdown text command. The Start button on the DUALSHOCK®2 analog controller and the Pause/Break key on the keyboard no longer pause the game, but can now be used to log out of FINAL FANTASY XI. /locker - View the contents of your Mog Locker. /besiegemap - Accesses the "Besieged" map. Can also be viewed using the "Region Info" option on the main menu. The "PlayOnline" setting on the FINAL FANTASY XI GAMEPAD Config menu has been changed to "Log Out." Since the implementation of the latest version update on Apr. 17, 2006, the following issue has been discovered. - Players who form an alliance will remain in the state of being in an alliance even after it has broken up. *This issue can be resolved by replacing the party leader, breaking up the party, having all party members move to another zone or log out. The recipe change for "Tavnazian Tacos" that was postponed in the February 21st version update has been cancelled after a thorough consideration of possible effects on the in-game economy.